Publisher: Running Pr Book Pub, Jackson, Tennessee, U.S.A. In May 1774, soon after City Tavern opened for business, Paul Revere arrived at its doors to announce Parliament's closing the port of Boston. In 1777, the Tavern hosted America's first official Fourth of July celebration. And in 1789, this landmark inn held a banquet for George Washington as he passed through Philadelphia en route to New York for his presidential inauguration.Through the Revolutionary period and the early republic, City Tavern was the center of American political and social life. More than a meeting place for prominent Americans, the Tavern also acquired a reputation as the best restaurant in North America, the setting for suppers, as elegant as was ever laid on a table,” according to John Adams. Since Philadelphia's seaport was the lively center of eighteenth-century commerce, it's no surprise that it was here that the finest imported foodstuffs, Madeiras, clarets, and exotic fruits and spices met the bounty of the New World, giving the City Tavern chef an unlimited supply of ingredients.More than two hundred years later, the Tavern is still garnering high praise for its gourmet cuisine and elegant atmosphere. 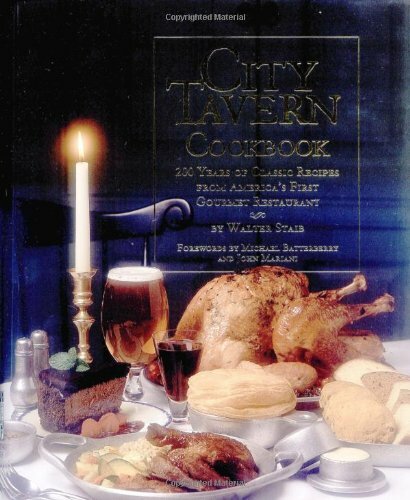 The fusion of classic European cookery, American game and produce, and exotic island spices enjoyed by early visitors to the Tavern is recreated every day by chef/proprietor Walter Staib.City Tavern Cookbook reveals the richness and diversity of the eighteenth-century table. Within these pages are 200 authentic recipes that capture the best of early American gourmet cuisine. These dishes, updated for modern tastes, include world-famous West Indies Pepper Pot Soup, Roasted Duckling with Peach Chutney, Lobster Potpie, Thomas Jefferson's Sweet Potato Biscuits, plus Martha Washington's Chocolate Mousse Cake. With fascinating historic tidbits and trivia that bring eighteenth-century American gastronomy to life, City Tavern Cookbook offers the reader a delicious lesson in culinary history. Chef Walter Staib is the highly acclaimed chef and proprietor of Philadelphia's celebrated City Tavern restaurant. He is the author of two other cookbooks: City Tavern Cookbook, and City Tavern Baking & Dessert Cookbook. He has been named the Culinary Ambassador to the City of Philadelphia,” and has received numerous awards and recognition for his outstanding cuisine. Beth D'Addono, a food, travel, and lifestyle writer, has contributed to numerous national and regional newspapers, guides, and magazines including Gannett Newspapers, the Philadelphia Daily News, Atlantic City Magazine, Where Magazine, Birnbaum and Access Travel Guides, Modern Maturity, and Philadelphia Magazine. A resident of Philadelphia, she is a member of the Society of American Travel Writers.